picture: witchhunter.net Old article from Chronicles New Era #3! This is a new feature looking at the work of the artists and sculptors who provide the images and models which breathe life into the Warzone and Chronopia worlds. First up we´ve got miniature sculptor Kev White. Kev´s love of fantasy and sci-fi goes right back to primary school when one of his teachers introduced him to the work of J.R.R. Tolkien, namely "The Hobbit". His first foray into the games industry was working as a figure painter for Games Workshop where he picked up basic pointers on the art of figure sculpting from Jez Goodwin and Gary Morley. 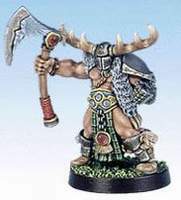 From there Kev went on to do a lot of freelance miniature design work between the years of 1993 and 1998 such as Harlequin and Ground Zero, eventually finding himself with Target Games Design Studio at the beginning of ´98. Painter: Mark McNaught Kev enjoys designing Chronopia miniatures best because, as he puts it, there is a lot of scope for the artist to experiment with and personalize fantasy models. He cites Paul Bonner´s artwork as a big influence on his own style, and by a strange coincidence the Hobbit poster he fondly remembers from his schooldays is a Bonner design. Kev admires the work of other sculptors and those of Roy Eastland in particular. He appreciates the texture and character that Roy gets into a miniature and the fine touch he has with plate armor and clothing. Kev struggled when asked to choose a favorite miniature from his own repertoire. He likes some of the females he´s done, such as the Blade Maiden leader and the Etoiles Mortant Hero but he´s also especially pleased with the Jungle Kommando TRS Specialist.